Arnott's new double choc mud Tim Tams remind of me of a recent Phamly dinner where Little Sissy Pham accidentally put middling-niece off both her dinner and dessert with but a few words. First on the menu was wonton noodles, which Middling heard as 'one tonne noodles!?!?! Um, I ate already.' Her mum explained it was the yummy noodles with soup that she loves. She enjoyed her dinner after that. After dinner came chocolate cake with strawberries and whipped cream. Little Sissy Pham told our little prep goer who makes mud pies at school the cake's name to which middling exclaimed "MUD cake?!?!?!" and refused to eat any. It took a lot of coaxing to even get her to try the cake. By try I mean she slowly poked her tongue out and touched an edge with the very tip of her tongue before setting it back down. Probably didn’t help that it was a gluten-free cake – another failed attempt to help Little Sissy Pham’s terrible case of psoriasis through dietary means as well as the bazillion creams and UV treatments the docs have tried over the past decade. Anyway, the happy ending is I got to eat my cake and Middling’s too. If I ever turn off my greedy gut to share double choc cake Tim Tams with my niece I'll tell her "it's a yummy chocolate biscuit. I love it, it's my favourite." Because you don’t tell a 6 year old it’s mud. On a serious note, I'm not a Tim Tam fan to begin with but I am obsessed with the double choc mud ones. They smell of delicious mud cake and have soft, muddy chocolate in the middle. So good. 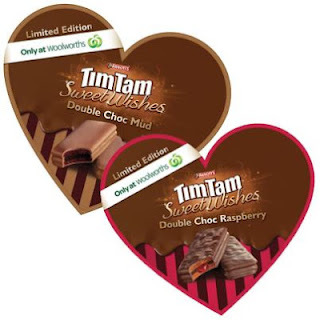 You gotta try them – they’re part of the exclusive Sweet Wishes range of Tim Tams and this flavour is only available from Woolworths.